“Better is a poor man who walks in his integrity than a rich man who is crooked in his ways” (Proverbs 28:6). I had just arrived from a trip to Hong Kong last Monday when my hardworking office assistant, Patience Namangala, gave me an envelope in which there was an invitation for Felistas and me to attend a bond redemption ceremony at the five-star Taj Pamodzi Hotel the next day (see picture below). 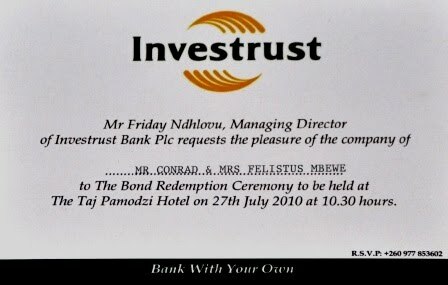 Three years ago we had invested K10 million (US2,000) into Investrust Bank bonds. The bank needed to raise K100 billion and was offering much better returns than the normal bank interest we were getting on our savings account. So, it made a lot of sense to give them our little savings and see what would come of it. You do not need to be a genius to guess the kind of thoughts that filled my mind at that point. Firstly, I thought the Lord was rebuking me. Felistas and I had just got a loan from a bank for the purpose of beginning to build a house using a National Housing Authority scheme where you pay them in instalments and they build for you over a period of one year. 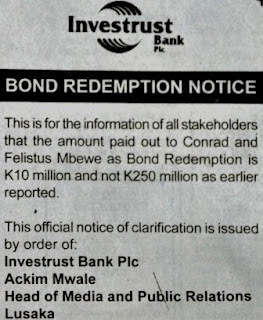 The loan amount was about K250 million (US$50,000), and so I was wondering whether the Lord was saying, “Son, you should have trusted me and waited one more month and I would have answered your prayers in this miraculous way. Now, you have a loan to clear—plus interest!” Then, I also began to think of what the tithe on that amount would do for KBC, especially in the area of missions where my heart really is. However, as the event drew to an end, I became more convinced that this was a mistake. When I mentioned it to someone at the event who was representing an insurance company, he said, “Mistake? What mistake? Have you seen the number of witnesses here? They had better give you the money or else we will all stand up for you. We heard them announce it!” I was still not convinced. So, as soon as I got back to my office, I rang the bank and told them that I thought they had made a big mistake. Thankfully, they soon confirmed that I was right. 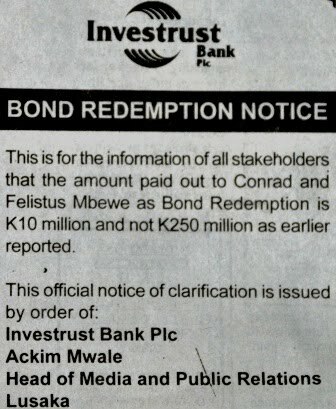 The cheque should have read “K10 million” (Indeed, that is what it read in words, but the digits read K250,000,000). They apologized for the error. I told them, “I am willing to forget everything, but on one condition—that you tell those journalists you invited to the event about the mistake you have made so that they do not publish it. If you do not, and the world hears that I received a cheque of K250 million, half of my village will be at my doorstep the following morning wanting a share of it!” I was assured that this was going to be done. To be on the safe side, I informed the church elders and deacons in advance, just in case this issue still came out in the papers and they started getting calls from members about how on earth I had accumulated that kind of money. Anxious to make sure that that the bank had done its job, I watched the national news and sure enough they just showed Felistas and me listening to the speeches. Phew! However, the following morning (Wednesday) I started getting messages congratulating Felistas and me for the K250 million we had been given the day before. 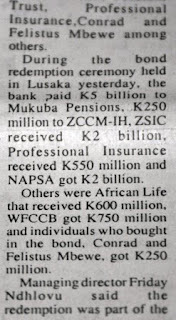 The Times of Zambia, with distribution right across the nation, stated in no uncertain terms on its business page that we had been given this colossal sum of money (see insert on left)! So, I spent my day assuring everyone that this was a big mistake. I tried to get a hold of the gentleman at the bank who assured me that this would not happen, but completely failed. I left my phone number and he was not calling back. 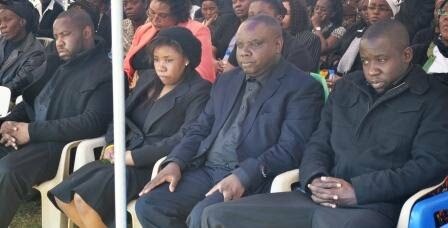 Thus I called a good friend and lawyer (who also happens to be a relative), Mr Mumba Kapumpa, for help. He was once the chief executive of the Securities and Exchange Commission, the institution that regulates how the stock exchange behaves itself. 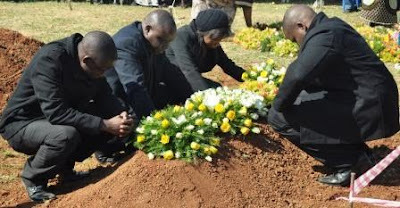 He gladly took up the matter for me and got the bank to issue a correction the next morning (Friday) in the same newspaper concerning the grave mistake that they had made. That was how “a dream that was almost true” came to an end—and my bank account balance still reflects the little money that I have genuinely worked for! I have been told over and over again that other people would have made some cool cash out of this error. I know, but “better is a poor man who walks in his integrity than a rich man who is crooked in his ways.” Certain things must be left to the world of dreams. Reality is about earning your wealth through hard work and sweat, and not through someone else’s typographical error. Abigail Zulu (1958-2010)—A Rare Jewel Indeed! “The memory of the righteous is blessed, but the name of the wicked will rot” (Proverbs 10:7). It was on 9th July in the afternoon, when I got a text message on my cell phone from one of my fellow elders, Charles Bota. It read, “Brethren, Levi Zulu’s wife, Abigail, (both of Lilanda Gospel Hall) has died today in a car accident in Mansa. Contact Misheck Daka for details”. My reply was, “Noooooo!!!!!! !” The sad news was soon confirmed by one message after another. I had to pause and pray. If I ever doubted that first message, I could do so no longer when on Tuesday, 13th July, we laid Abigail’s remains to the grave. Abigail leaves behind a husband (Levi Zulu), two sons (Isaac and Daniel), and a daughter (Tamara, see the next two photos below of mom and daughter). My purpose in this brief blog entry is not to write a eulogy, but to recall “the memory of the righteous”. 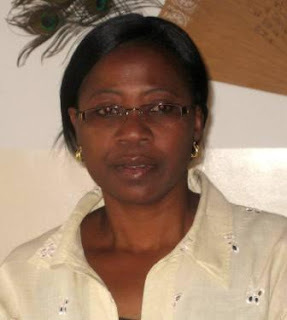 My memories of our late sister, Abigail Zulu (nee Tembo), go back slightly more than a quarter of a century. I had just arrived at the University of Zambia (UNZA) to study Mining Engineering in 1979. Just prior to my arrival there, I had experienced a transformation that had a seismic impact on my whole life. I had just been converted to Christ! I was a new creation; the old was gone and the new had come. And now I had no clue how I was going to survive the infamous UNZA, ill-famed for its abundant iniquity. Among the many means that God used to keep me in the straight and narrow was the example of mature and godly brothers and sisters in Christ, who were a few years ahead of me in their studies, and who were attending Lusaka Baptist Church. When I got to UNZA there was a whole galaxy of them! Levi Zulu and Abigail Tembo were in that group. These were the role models I looked up to. In those days, Lusaka Baptist Church used to have a church bus that picked us up from UNZA and dropped us back after church activities. These two gracious souls were sure to be in the parking lot when the bus arrived—come rain, come exams, come...you name it, they were there! The consistency of their lives spoke volumes to me, especially because I knew that Engineering (which Levi and most of the other brothers were studying) separated men from boys. Yet, it did not matter whether the church meeting was a morning or evening worship service, a Bible study, a prayer meeting, or some evangelistic outreach event. If they were absent you knew that something very big had happened to them. Also, the fruit of the Spirit radiated from the lives of Levi and Abigail in a way that would be difficult to describe. Love, joy, peace, patience…, were all oozing out of their beings whenever I was with them. To me, as a young Christian, I felt that here were two lives, among many, that showed how Christianity was to be lived. I wanted to be like them! 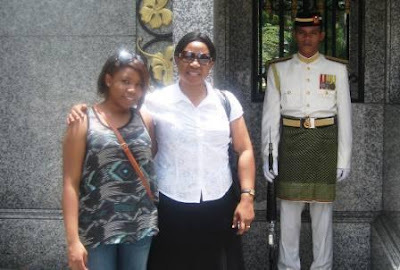 Whereas Levi always won my respect by the way he sought to faithfully divide God’s Word in small group Bible studies in our halls of residence, Abigail won my admiration by her modesty and propriety in dressing and general demeanour the whole period that I was at UNZA. Hence, I related to Levi as my elder brother, and to Abigail as my elder sister. They acted as moorings for me in the tempests of campus life. By the time they left UNZA, I had found my feet. So, when Levi and Abigail got married, I always thought that they were a perfect match made in heaven. I never once doubted that their home would be a well where the thirsty would draw water and a table where the hungry would find bread. Soon after their graduation and their wedding, they moved from our Baptist circles and joined the Christian Brethren circles. Hence, our paths rarely crossed. Although I never had opportunity to spend more than a passing visit in their home, wherever I came across their names being mentioned, the testimony remained the same. It was a testimony of the fruit of the Spirit being poured out immeasurably from their lives in faithful and consistent Christian service. And, of course, each time we met, their love for the Lord and for his people continued to deeply impress me. Now Abigail, “my elder sister”, is gone to her reward. 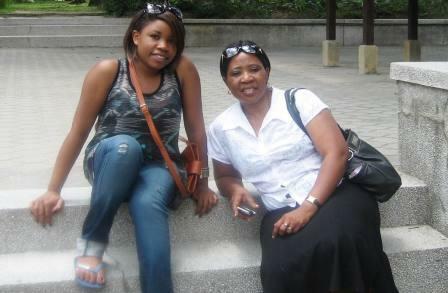 I want to join my voice with the many others that are thanking God for the impact of her life. I wonder where I would be if the Lord had not brought into my life individuals like her soon after my conversion, to put ballast into my walk with the Lord. Indeed the Bible is true! “The memory of the righteous is blessed.” May every recollection of her spur me on to pray for Levi and their children that God himself may fill that void that her departure has left! Amen. Let me end with two testimonies from friends whose acquaintance with Abigail spans the same years that I have spoken about, if not longer! They were sent on the occasion of Abigail's funeral. “And [Joshua] said to the people of Israel, ‘When your children ask their fathers in times to come, “What do these stones mean?” then you shall let your children know, “Israel passed over this Jordan on dry ground…” so that all the peoples of the earth may know that the hand of the Lord is mighty, that you may fear the Lord your God forever’” (Joshua 4:21-24). 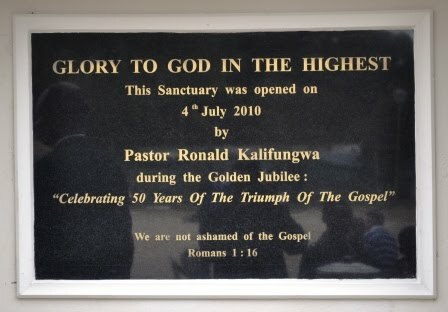 On 2nd July 2010, Lusaka Baptist Church clocked 50 years and they decided to have God-glorifying celebrations to mark this occasion under the theme “Celebrating 50 Years of the Triumph of the Gospel”. 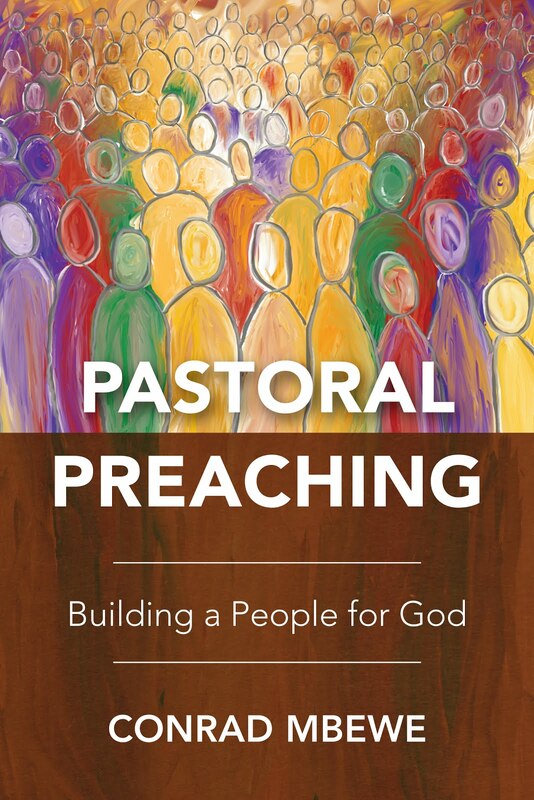 All the five preachers were asked to preach from the church’s motto, “We are not ashamed of the gospel...because it is the power of God for the salvation of everyone who believes” (Romans 1:16). 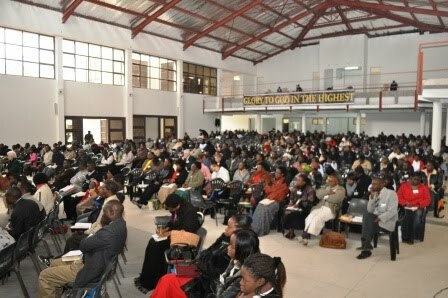 In the preparatory stage of this event, Lusaka Baptist Church opened a special website dedicated to the commemoration of their first fifty years. You may visit the site by clicking here. Lusaka Baptist Church is the second oldest English speaking Baptist church in Zambia, second only to Ndola Baptist Church which was constituted in 1953. 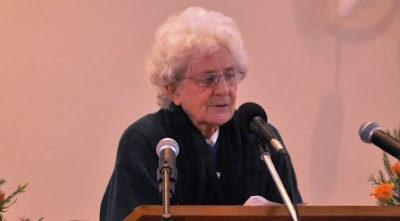 The Jubilee Celebrations were a time to hear good preaching and to recall some events that occurred in the first fifty years of the church’s life. We heard various individuals who were involved in the life of Lusaka Baptist Church being interviewed and sharing their testimonies (as was the case above when the only three Zambian pastors who have ever pastored Lusaka Baptist Church were being interviewed by Isaac Makashinyi). Our congregational singing was interspersed with special songs by various groups (such as "The Synod", below). An effort to compile the history of Lusaka Baptist Church was made and all of us went away with this compilation in the form of a booklet. 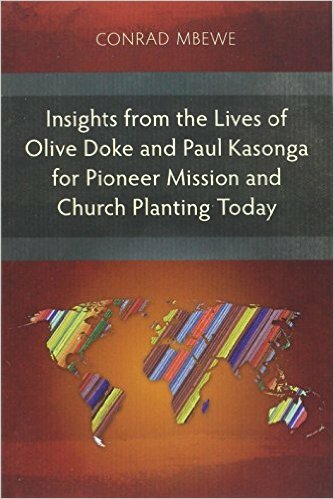 The chapters were based on the nine pastors that the church has had in its fifty years. Of course, we also went away with mementos in the form of pens, t-shirts, etc. I missed the first day, i.e. Sunday 4th July. Being a Sunday, I was up to my ears in work at Kabwata Baptist Church. My son, Mwindula, was there and came back with glowing reports about how the event went. Joe Simfukwe, Lusaka Baptist Church's first Zambian pastor, preached on the person of Christ presented in the gospel. Later, John Symons preached on the content of the gospel. I was present on the second day (Monday) and part of the third day (Tuesday). I found their new and spacious building almost finished (see first photo above, and the one below), and that was where their meetings were being held. After about two years in “the tent of meeting” this was indeed a welcome change! On Monday, Alfred Nyirenda preached on the gospel as the power of God for salvation. He was as animated as ever. There were three seminars held. The speakers were Choolwe Mwetwa (“What will it take to possess the land in the next 50 years?”), Isaac Makashinyi (“Our Baptist heritage”), and myself (“The Triumph of the Gospel through PowerPoint”). Perhaps one of the highlights for me was meeting so many people from the years I was at Lusaka Baptist Church (i.e. from 1979 to 1984). There were those who were talking about the good old days at Lusaka Baptist Church in the 1960s and 1970s. I was better able to identify with those who spoke about the 1980s. We also had individuals such as Christo Beetge (above) bringing greetings from sister churches outside Zambia, and especially from South Africa. I was glad to meet Joe and Alice Simfukwe, and John Symons (on the left). 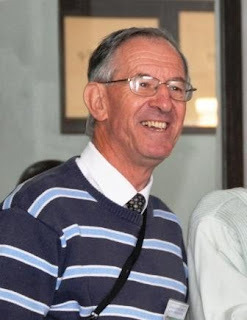 I have spoken about my incalculable debt to Joe’s ministry in the formative years of my life in my previous blog posting (you can read it by clicking here). As for John Symons, I will always remember him for his advice when I went to his home in Kitwe to borrow a Greek textbook. 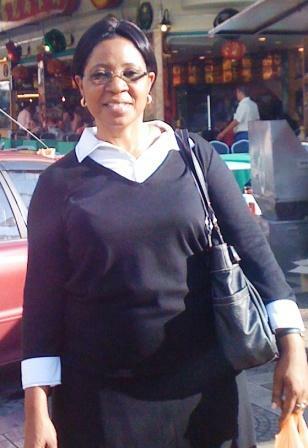 This was when I was working in the Mines and studying on my own for the ministry. He said, “Conrad, do not hurry to get into the ministry. Rather, study the mistakes that those of us who are already in the ministry are making, and make sure you do not repeat them!” Maybe it is this advice that has helped me to last this long in the ministry! Barbara Harris (below), the wife of the first pastor, Derek Harris, was also present and shared something of her testimony of the period when they were involved in the planting of the church. Derek pastored Lusaka Baptist Church before it was constituted as an independent local church. His pastorate ran from January 1959 until May 1961. The one disappointment was the state of the church booths. These were rooms allocated to each of the church plants of Lusaka Baptist Church over its 50 years of existence. Very little quality work went into the preparation of these booths. Judging from the amount of work put into the preparation and organising of the Jubilee Celebrations, this was certainly a big disfavour done by the “daughter” churches. 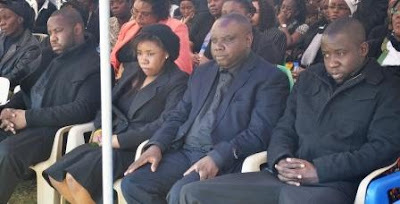 Kabwata Baptist Church was equally guilty, and on behalf of the daughter churches of Lusaka Baptist Church, I offered heartfelt apologies just before I preached. 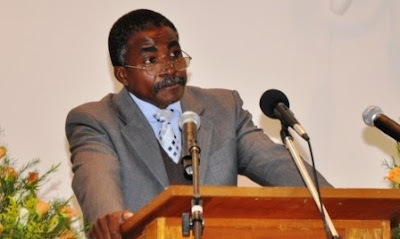 Ronald Kalifungwa (below), the current pastor of Lusaka Baptist Church, closed the whole event by preaching on the need for us to glory in the gospel. He showed how Paul ought to have been ashamed of the gospel because at a social level there was very little about Jesus worth boasting about—born in Nazareth, a carpenter’s son, died by crucifixion (a type of death considered to be a curse), etc. What did Paul, therefore, mean when he said that he was not ashamed of such a message? It means Paul was so proud of this message that he was willing to live and die for it. In applying this to those of us who were in attendance, Ronald pleaded with us that if we were to be truly proud of the gospel we needed to seek to know Christ doctrinally and experientially. He exhorted us to be ready, above all else, to preach this Christ and his saving work and power every time and everywhere. Finally, he implored us to worship Christ in this life, as we shall do for all eternity. It was on that note that the event ended. 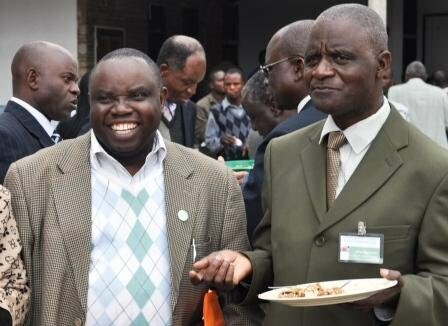 After thanking all those who participated in organizing and speaking at the celebrations, Ronald urged Lusaka Baptist Church, and all who were present in the meeting, to ensure that as a way forward we should have a biblical worldview that will make us want to make a difference to Zambia and the world. The gospel that has so affected our lives should now go forward and change the landscape of our nation in every sphere! I think that our churches need to take a leaf from Lusaka Baptist Church in their effort to recall their history. Unless our church members know where we have come from, they cannot know where we are going. The past gives a sense of direction for the future. 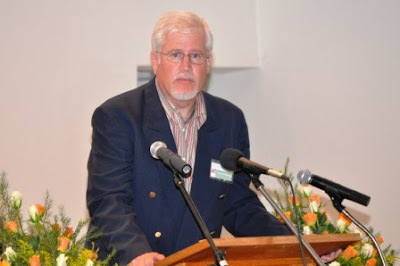 Sadly, most Zambian Christians know a whole lot about John Calvin, George Whitefield, Charles Spurgeon, etc., but possess abysmal ignorance of our own Zambian church leaders through whom the Zambian church has been nurtured into what it is today. 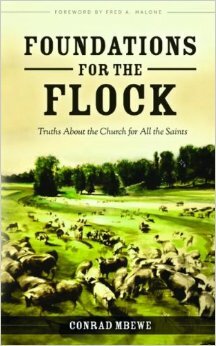 The fault lies at the door of those of us who are church leaders today because we are not recounting the great deeds of God in our past. It is almost as if the Baptist faith jumped from Spurgeon to us today with no-one else in between. We need to repent of this and show the chain of great men and women who have sacrificed so much for us here in Zambia so that we can have the robust Christianity we are enjoying today.